In the absence of President John and 1st VP Meredith, 2nd VP Bill Gile ran the meeting. 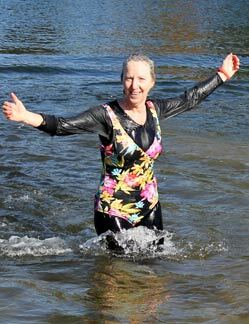 Bill reminded the Club of two upcoming events: Wine Down For Warmth and The Laconia Holiday Parade. The Laconia Holiday Parade: The Club will be entering a float and volunteers are needed. The parade will be held on Sunday, November 29th and begin at 4:00 pm from Wyatt Park. If you would like to volunteer, please contact Scott Laurent, Rob Reid or Meredith Michaud. For more details on the parade, "click" here. Wine Down For Warmth: Proceeds from this fund-raiser, which will be held,November 19th at the Beane Conference Center, will be donated to The Santa Fund. Local artist Larry Frates will be giving a demonstration on how to create a scenic painting. Paint supplies including: paint, brushes, canvas, etc., will be provided to those attending. Tickets, which are available online only, is a BYOB, and seating is limited. Members please help get the word out. To purchase tickets online, "click" here. 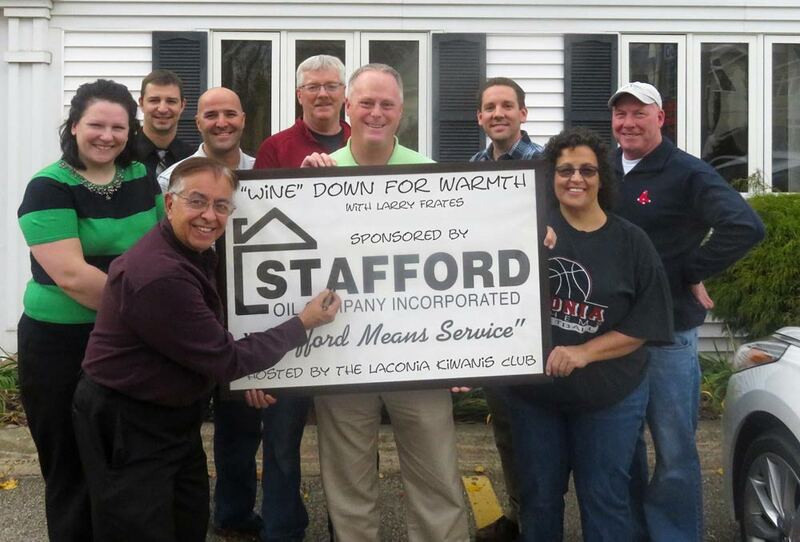 Larry Frates draws thanks from members of the Laconia Kiwanis Club and Santa Fund for the kindness of Curtis Stafford VP of Stafford Oil in sponsoring the upcoming Wine Down For Warmth event, which will be held at the Beane Conference Center on November 19th. 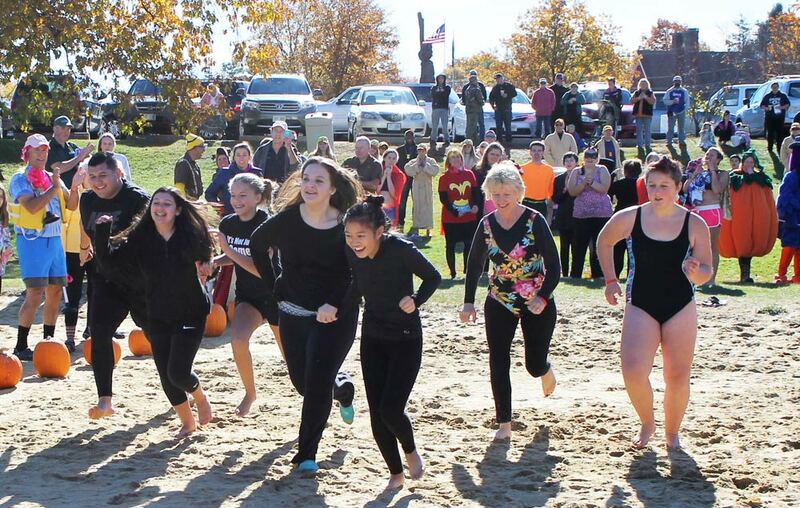 Bill also reported on Key Club events including the annual Salvation Army Turkey Plunge which was held on October 31st. 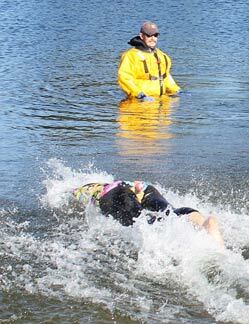 For pictures and details of the event scroll down the page. 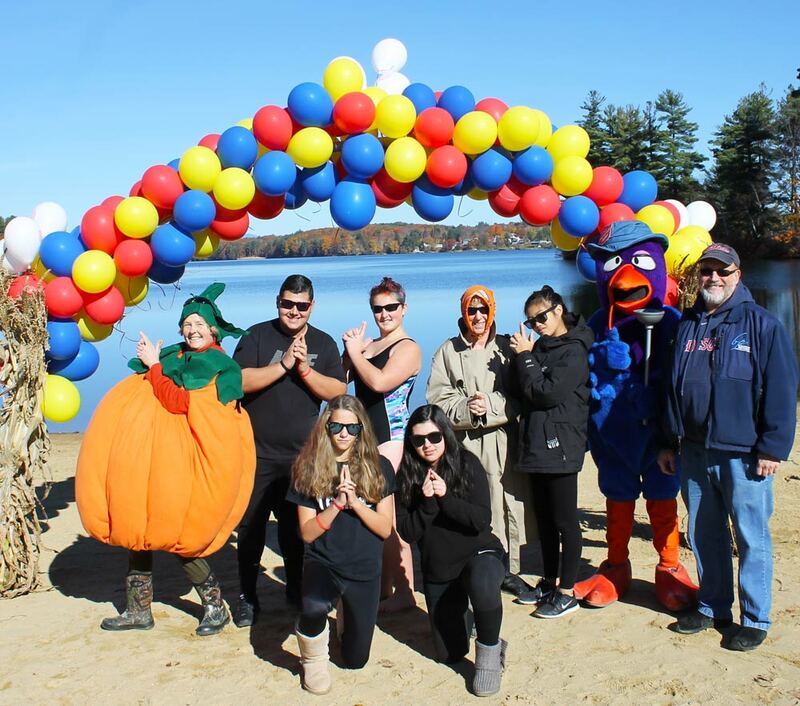 On Saturday, October 31st Kiwanis Club Secretary/Treasurer Kathy Calvin participated with the Laconia High School Key Club/Interact team in the 11thAnnual Salvation Army Turkey Plunge held at Opechee Park on North Main Street in Laconia. 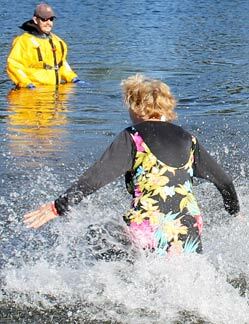 At the time of the plunge, the water temperature was 52 degrees and the air temperature was 44 degrees. 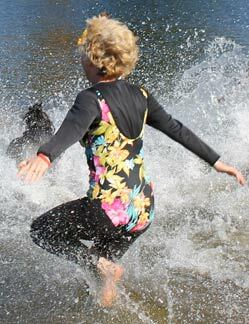 Kathy Calvin demonstrates the art of the plunge. Thursday - November 19th - Venue: Beane Conference Center For directions, "click" here. Monday - November 23rd - Venue: Taylor Community - Woodside For directions, "click" here. Sunday - November 29rd - For details, "click" here.